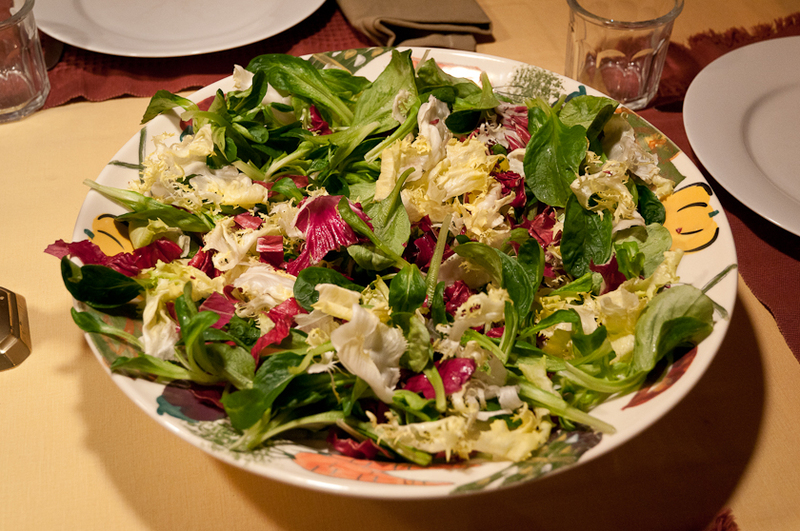 Radicchio, escarole and other members of the chicory family like frisée and Belgian endive are often called bitter greens, but their bitterness is slight and pleasant, a perfect counterpoint to the sweetness of pears, roasted roots or squash, nuts or cheese. And sautéed or grilled these bitter greens mellow, taking on their own sweetness. I began harvesting my radicchio and escarole a month ago and will continue enjoying them both raw and cooked as the days darken and fall turns to winter. 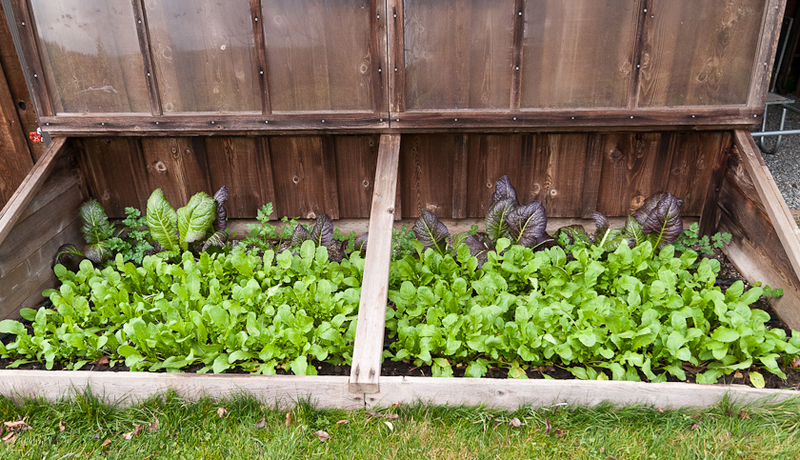 These sturdy-leaved greens will grow year-round, but I prefer to plant them in mid-July for harvest from late September on. 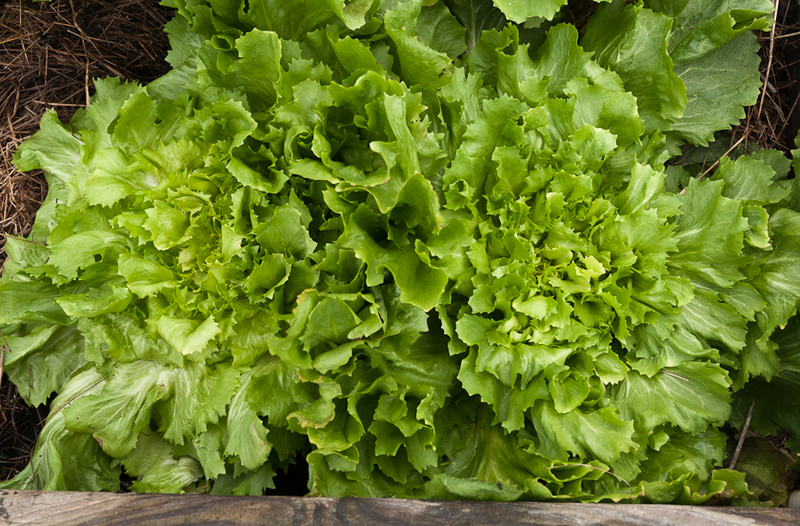 Not only do they go with the rich fruit and vegetable flavors of the fall and winter kitchen garden, they actually gain a little sweetness as temperatures drop. 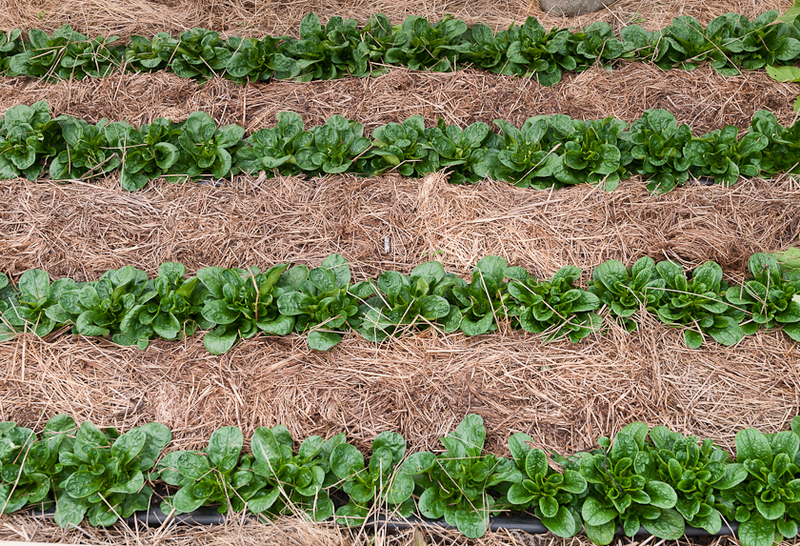 For this year’s radicchio, I planted Fiero, a tall, slender Treviso type and Indigo, a round-headed variety, and for escarole I planted Natacha, starting two dozen of each indoors on July 18th and setting them out August 5th, spacing the plants twelve inches apart in rows a foot apart. When winter rains begin, I’ll cover the plants with a low plastic tunnel because while cold doesn’t hurt them, rain will make them rot. 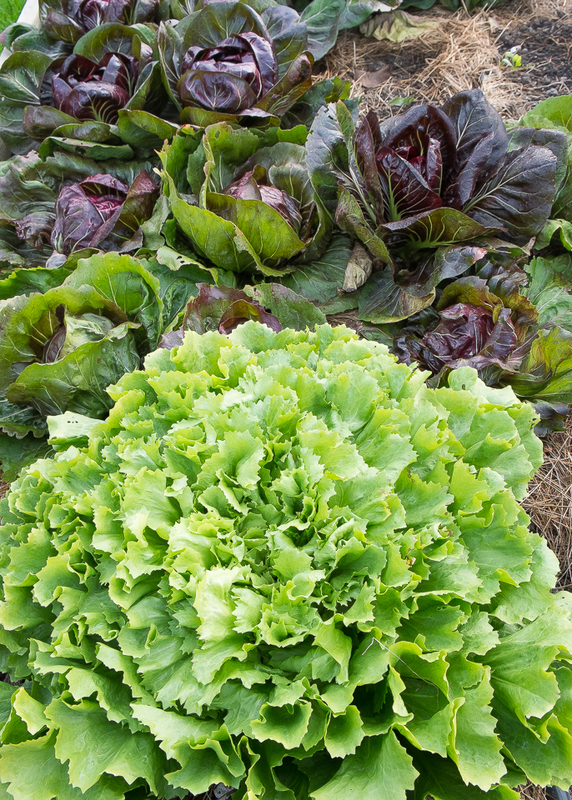 While radicchios form winey red, round or upright heads, escarole spreads out into great rosettes of light green leaves. Also known as Broad-leaved Batavian, its outer leaves are truly broad and quite succulent, but hidden in the middle, blanched by these outer leaves, is a center of creamy yellow, crisper, smaller leaves. When I harvest a head of escarole I imagine both a sauté and a salad and wash the leaves accordingly, ending up with a big pile of outer leaves to sauté and a smaller pile of inner leaves for salad, two equally delicious treats. 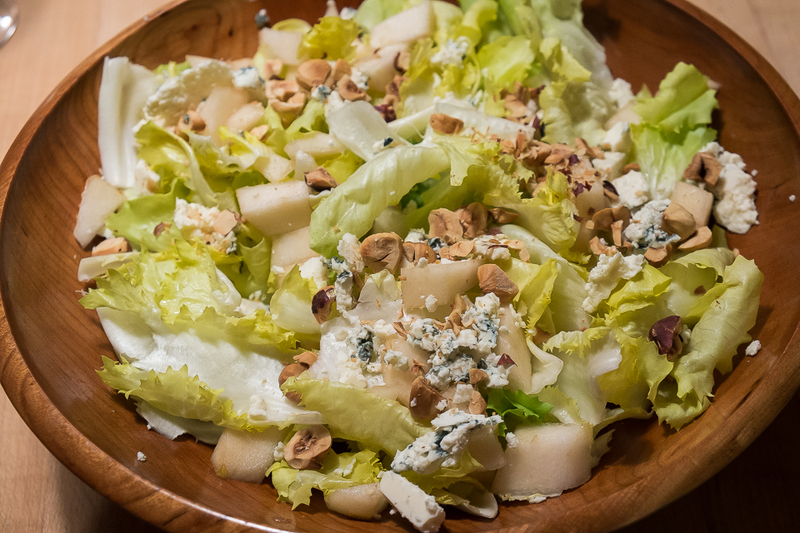 The other night I added sliced Highland pears, crumbled Gorgonzola cheese and roasted hazelnuts to the inner leaves of escarole and dressed this bitter, sweet, pungent and nutty combination with sherry vinaigrette. The next night, I sliced the outer leaves into ribbons and sautéed them in olive oil, garlic and red pepper flakes, added some cannellini beans and served this mix on pasta. 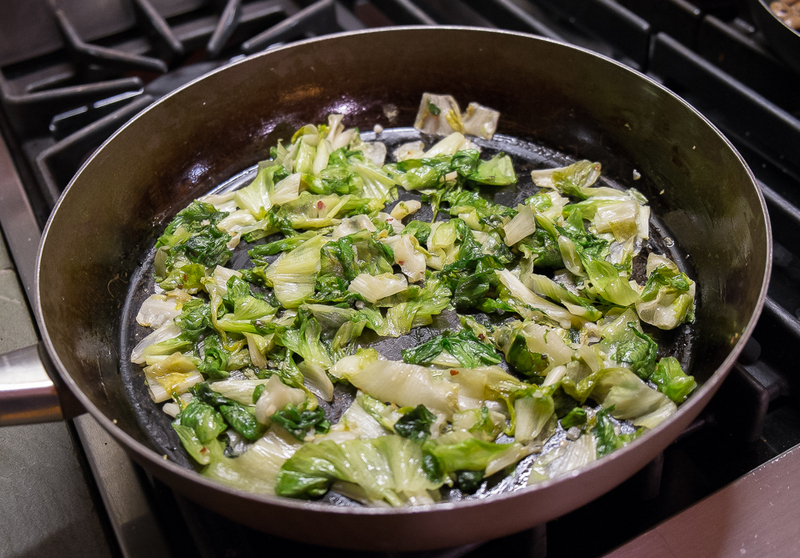 Either alone as a side dish or mixed into a pasta sauce or soup, sautéed escarole keeps some of its pleasant bitterness but gains a mellower, sweeter flavor. It’s a good thing one head of escarole offers both raw and cooked options; I would have a very hard time deciding between salad and sauté. 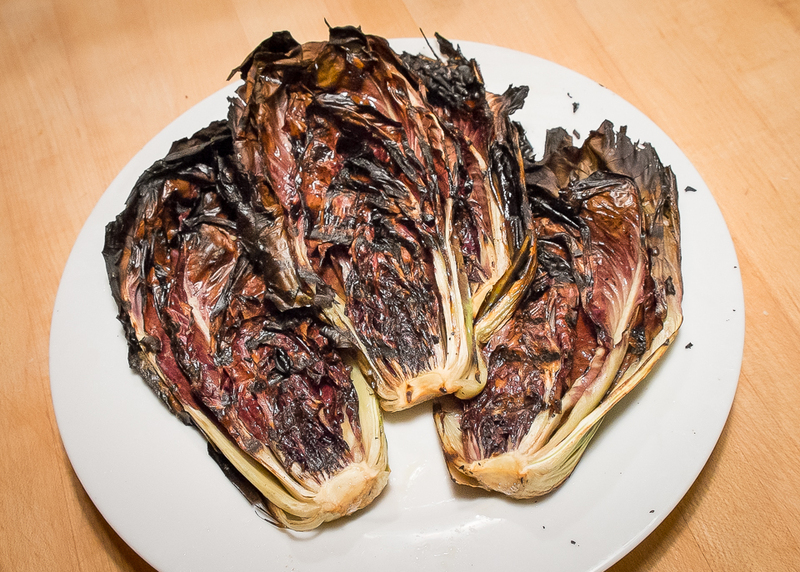 Radicchio is also delicious both cooked and raw, continuing the preparation dilemma. 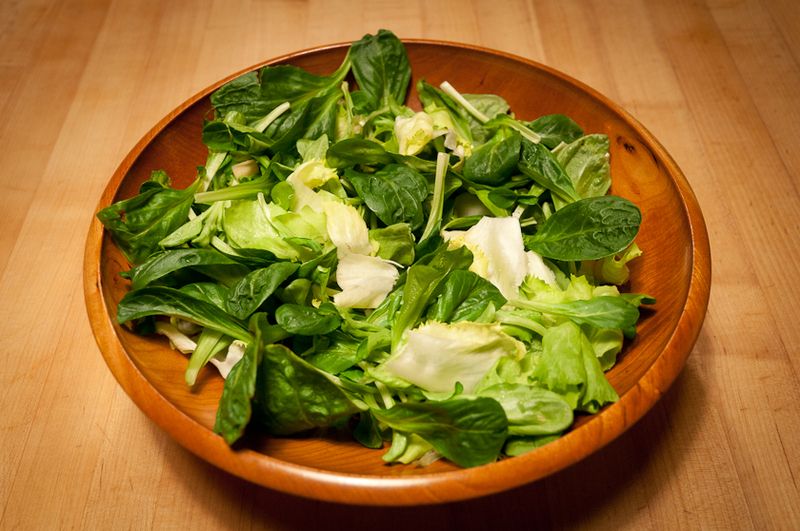 As with escarole, cooking mellows the bitterness and brings out the nutty flavors, but raw offers beautiful bitter with sweet salad possibilities. 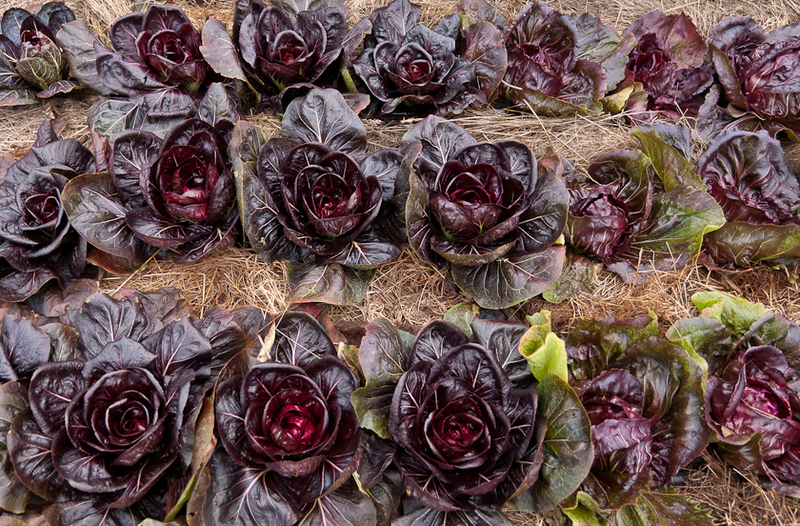 Radicchio’s dark red color, so pretty in salads, fades with cooking but the mellowed, slightly smoky flavor of grilled radicchio more than makes up for appearance. 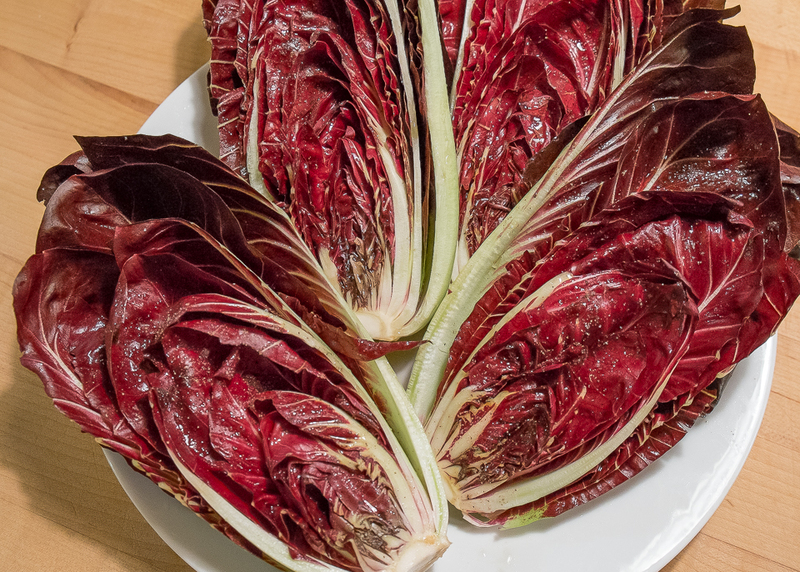 To prepare radicchio for grilling, slice the head into halves or quarters, leaving the stem intact to hold the leaves together. Brush with olive oil and sprinkle with salt and pepper. You can grill it right away or let it marinate for up to an hour before grilling. I usually wait at least twenty minutes to let the oil seep into the entire head. To grill the prepared heads, heat a gas grill to medium, place the heads cut side down for about four minutes then turn. They are ready in eight to ten minutes. The slightly charred and faded leaves aren’t very pretty but they are delicious. Last week, I served grilled Fiero radicchio with wild mushroom risotto and diced and roasted Delicata squash, a perfect blend of fall flavors. For the prettier side of radicchio, there are salads. 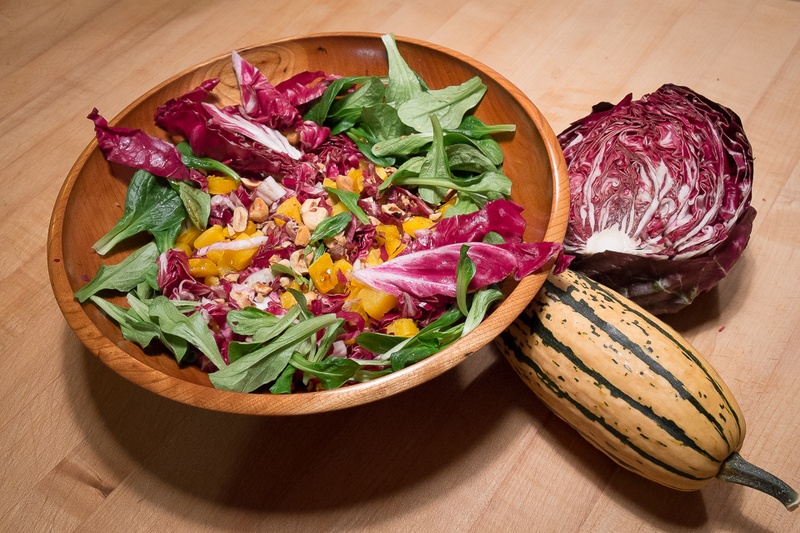 For one the other night I sliced a round head of Indigo into strips, added diced, roasted Delicata squash, roasted hazelnuts and a few leaves of mache and dressed the mix with Balsamic vinaigrette. 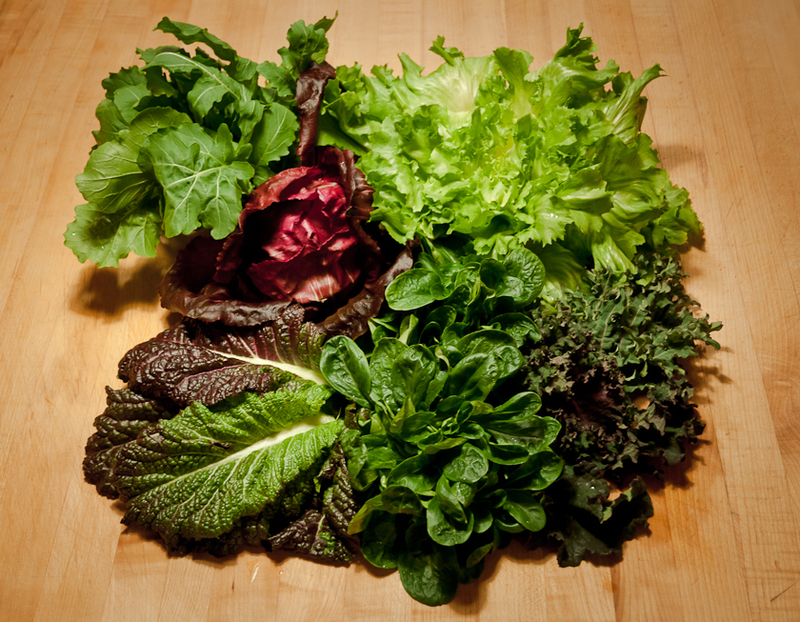 This is a salad to keep in mind for Christmas. Grilling, sautéing or tossing with whatever fall fruits and vegetables are on hand are my standard methods for preparing bitter greens, but for enticing variations on each of these methods as well as some new directions I’m eager to try recipes in Deborah Madison’s latest cookbook, Vegetable Literacy (2013). Of the dozen recipes she offers for the chicory family, two appealing choices for salads are “Shredded Radicchio with Walnut Vinaigrette, Hard-Cooked Egg, and Toasted Bread Crumbs” and “Radicchio, Escarole, and Red Mustard with Golden Beets and Avocado.” For cooked, there’s “Treviso Radicchio Gratin” and “Escarole and Potato Hash.” The hard part will be deciding which recipe to try first.